On March 30, the Prince of Darkness takes over The Geary. 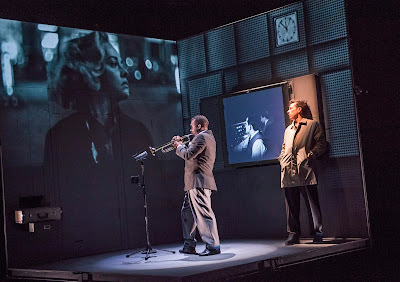 In Robert Lepage’s Needles and Opium, jazz trumpeter Miles Davis succumbs to the bliss and torment of heroin addiction, displacement, and love, only to rise again and create some of his most iconic music. The Davis we meet in Needles and Opium is a far cry from the global superstar that he became. In 1948, Davis was just 22 years old. He was a leading player in New York City’s 52nd Street jazz clubs and arrived in Paris with the Tadd Dameron Quintet to play in the Festival International de Jazz. In the city of light, Davis found that audiences were much more receptive to the quintet’s radical new form of jazz—bebop. A.C.T. 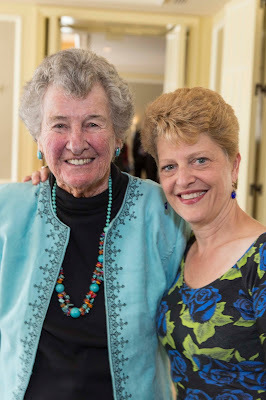 mourns the loss of Joan Sadler, one of our most energetic and beloved board members, who passed away on Sunday, March 26. Joan has been a part of A.C.T.’s family since the beginning. Just after moving to the Bay area in 1966, she attended the opening night performance of Tartuffe, A.C.T.’s first production in The Geary Theater. She was so moved that she immediately began supporting the company, bringing her tireless creative energy and experience as a freelance actor, broadcaster, visual artist, and photographer to the company’s volunteer organization, the Friends of A.C.T. She then served as secretary and vice president of the California Association for A.C.T., a fundraising foundation that helped keep the company afloat as it established itself in San Francisco. 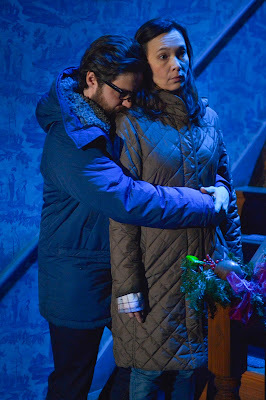 In Annie Baker’s John, running through April 23 at The Strand Theater, the word “watch”—in all its derivations—is used 37 times: 22 in the dialogue, and 15 in the stage directions. But what does it mean to watch and be watched? What does it feel like? You walk into an art gallery. As you move from painting to painting, you feel the hairs on the back of your neck stand up. You become hyperaware of those around you. You react to every movement, every sound. Your brain is sensing a threat, but from where? Then, you realize: the eyes in the paintings are following you. You are being watched. A technological transformation is taking place on the Geary stage. Actors are putting on their harnesses and walking down the walls of a revolving cube in Robert Lepage’s Needles and Opium, which runs from March 30 to April 23 at The Geary Theater. Needles and Opium is an exploration of creativity, addiction, and loneliness. It follows the lives of jazz trumpeter Miles Davis, writer and filmmaker Jean Cocteau, and a lovesick man named Robert (based on Robert Lepage). As these tales interweave, projections swirl, the entire set revolves, and the actors burst out of the walls and floor. During A.C.T.’s 50th-anniversary season, strong women are navigating their way through traditionally male-oriented spaces. In John, running through April 23 at The Strand Theater, two characters command center stage: Mertis and Genevieve, not just women but older women. 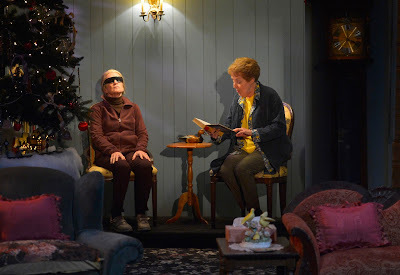 At first glance, 72-year-old Mertis—played by Georgia Engel—is a woman who is fulfilling a role we associate with older women; as the owner of a bed-and-breakfast, she has taken on a nurturing, mothering role. 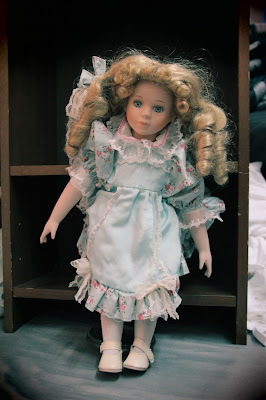 She cooks breakfast for her guests and has tea and treats always on hand. Together with her friend Genevieve (aged 85), Mertis provides advice to Jenny and Elias, two twentysomethings who are staying at the b and b. Here is Part Two of our interview with Pulitzer Prize–winning playwright Annie Baker, whose play John is currently running at The Strand Theater through April 23. Can you say something about how John came about? I read that you got interested in reading “uncanny texts like Hoffmann and Bruno Schulz and German Expressionist films.” Does what you’re reading often find its way into what you’re writing? And where else did this play come from, if you can say? When A.C.T. started planning its 50th-anniversary season, the company's management team tasked Resident Dramaturg Michael Paller with writing a book to celebrate this milestone. 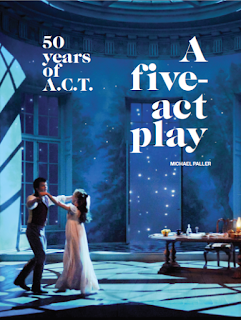 The result is A Five-Act Play: 50 Years of A.C.T., which will be published by Chronicle Books on April 27. Organized approximately by decade, A Five-Act Play is a historical retrospective. "The first period, from 1967 to 1979, was an era of triumph, culminating in the Regional Theater Tony Award in 1979." By contrast, says Paller, "The '80s were largely a disaster, with financial troubles, William Ball leaving as artistic director, and ending in the Loma Prieta Earthquake in 1989." 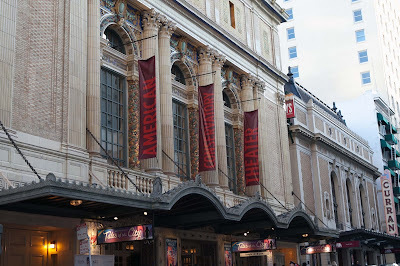 Since then, he says, there's been a sense of rebirth—with the renovation of The Geary Theater in the 1990s and the creation of the three-year Master of Fine Arts Program—and regeneration, most recently with the opening of The Strand Theater in 2015. In Annie Baker’s John, running through April 23 at The Strand Theater, the set is as much of a character as the four actors that inhabit it. Before rehearsals started, we sat down with scenic designer Marsha Ginsberg to get her thoughts on the real realism of Baker. What kind of research have you done for John? We started with the journey that Ken Rus Schmoll and I made to Gettysburg in May 2016. We went to several bed-and-breakfasts in the town and we retraced the travels the young couple makes in John—the road tour through the historic battlefield and the Dobbin House, which has a diorama displaying the crawl space used by slaves in the Underground Railroad. It was interesting to get into Annie Baker’s head and to understand the environment that affected the play and also witness firsthand the hauntedness of Gettysburg. As A.C.T. 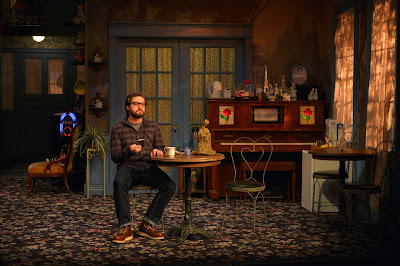 prepared for John, now running through April 23 at The Strand Theater, we caught up with Pulitzer Prize–winning playwright Annie Baker over e-mail for a quick Q&A. Here is Part One. You’ll be here for some rehearsal. Very often we’ll have a playwright here if the production’s the world premiere (as Ursula Rani Sarma was recently for A Thousand Splendid Suns), but rarely does a playwright choose to come once the play’s had a major production, especially in New York. We had John Guare here for Rich and Famous because he did some significant rewriting, Tom Stoppard for The Hard Problem, and Bruce Norris for Clybourne Park. But they’re exceptions. What brings you here for this production?